Japan is an intoxicating blend of the traditional and the futuristic. It is a unique culture, with a prevailing attitude of respect and deference that underpins its society and shapes its values, a land where natural beauty sits alongside endless urban sprawl. I quickly came to love the Land of the Rising Sun and its kind-hearted people when I had the extreme good fortune to spend a year living there as an English teacher. My year in Shimizu, in the Shizuoka Prefecture of central Honshu, had begun in a sweat-soaked heat haze as the humidity of a Japanese summer persistently sapped my energy. I was living in the shadow of the looming hulk of Mt Fuji, the iconic and still active volcano that dominates the skyline in the winter months. Not that I could see it. The summer humidity so effectively hid this giant of nature that for a few months after my arrival, I simply had no idea how high up in the sky I ought to be looking to try and catch a glimpse of its outline. When it comes to sport, much of Japan is baseball obsessed, a reflection of the American influence during the rebuilding of post-war Japan. Then there are the regular Sumo tournaments that symbolise the formality, the rituals and the traditions of Japanese culture. A more modern development is the growing love of football, at least in the mainstream. 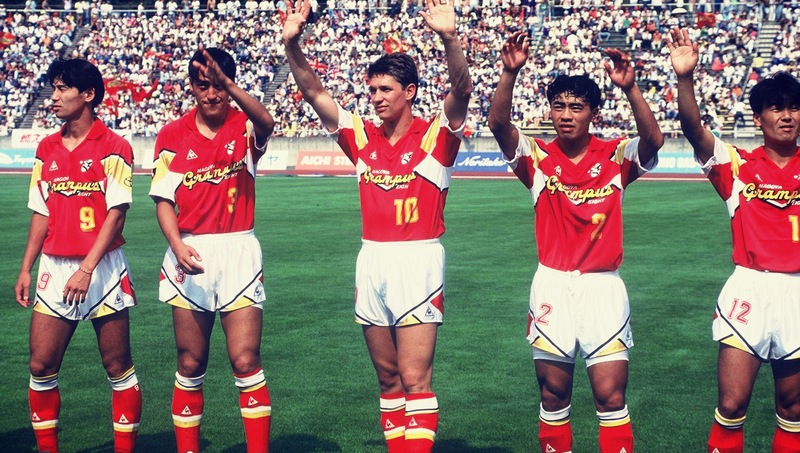 The J League came into being in the early 1990s, and with it came a variety of star names – Gary Lineker, Zico, Toto Schillaci – generally nearing the end of their careers. Their presence helped launch the new league into the global consciousness, as well as to build a strong domestic following. It was way back then that I first became aware of Shimizu, nigh on a decade-and-a-half before I was to move there. The local team, Shimizu S-Pulse, were one of the inaugural members of the newly-professional top flight, resplendent in their bright orange kit. By any normal measure, Shimizu was an unlikely place to locate one of the 10 teams to be part of the first season of this new era. 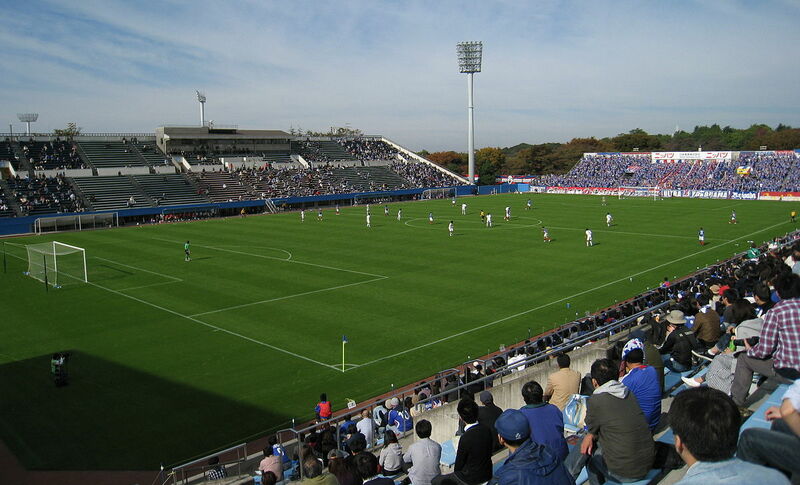 The club hadn’t even existed prior to the launch of the new league, and the town itself is a coastal offshoot of the much large city of Shizuoka. 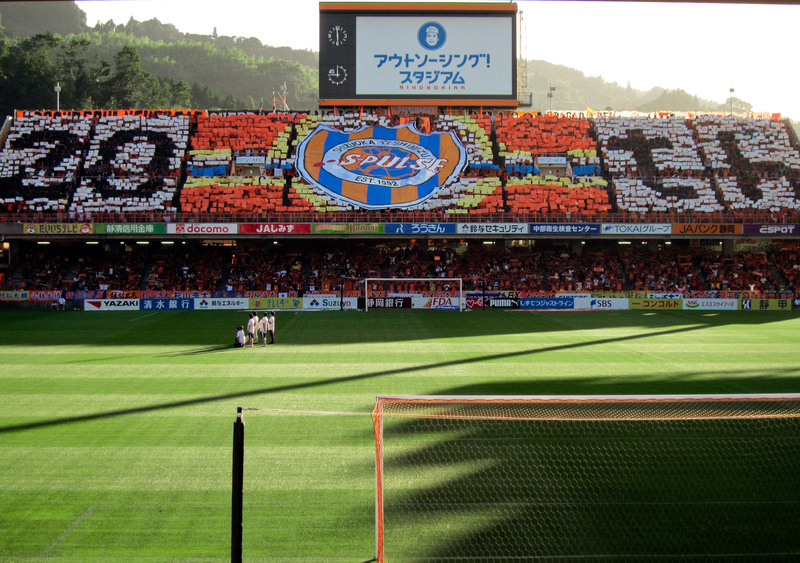 And yet the Shimizu area is one of the few parts of Japan to have a football tradition. Where schools in much of the country saw baseball as their sporting priority, Shimizu schools pushed football as their primary choice. This was a football area, known for developing some of Japan’s best players before professionalism came along. More recently, the likes of Shinji Ono and Shinji Okazaki have come through from Shimizu S-Pulse to more global renown. It seemed fitting that the town was to be a part of football’s modern revolution in Japan, and indeed for a time they fielded players drawn exclusively from the Shizuoka Prefecture. This was a unique distinction in Japan, emphasising the wealth of local talent coming from a truly football area. S-Pulse were for a time the Japanese equivalent of Athletic Club in that regard, if you will. 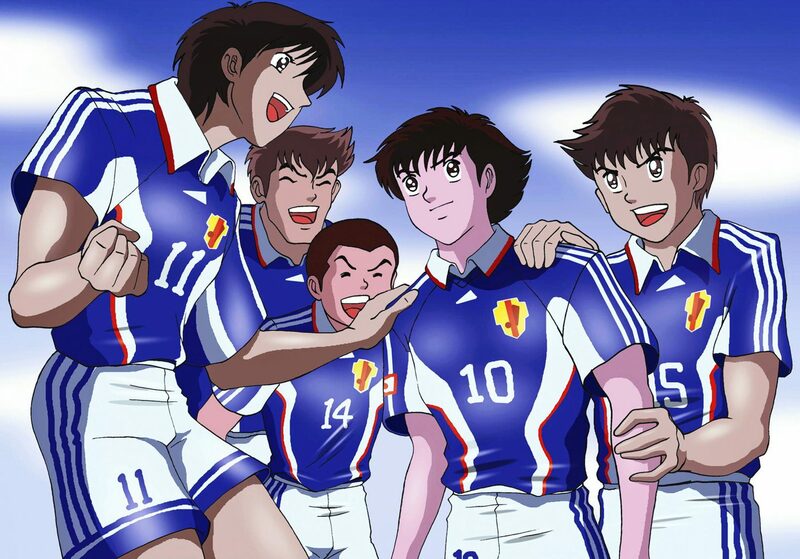 As football developed increasingly in Japan, this couldn’t last. Gradually the club embraced an impressive array of imports including Daniele Massaro, Freddie Ljungberg, Ahn Jung-Hwan, Frode Johnsen, and a raft of Brazilians. As I began to explore my new surroundings, cycling along the roadside from my traditional house with its sliding doors and paper windows, I hunted out the local stadium aiming to begin my connection with the football team I would come to love. It was only a short ride away. A few twists and turns brought me to the foot of Nihondaira mountain. A short way up the road to the top overlooking the busy port town below, the Nihondaira Stadium is perched in what is one of the world’s most spectacular settings for a football stadium. On the foothills of the small but steeply rising mountain, the stadium marks the transition from urban areas below to farmland above. The slopes of Nihondaira are covered in row after row of neatly clipped green tea plants – a product Shizuoka in general is rightly renowned for – and numerous orange trees producing the small, deliciously sweet mikan that are responsible for the colour scheme chosen for the S-Pulse shirts. It oversees the town below, with its bustling harbour and narrow streets. But the stadium’s real beauty would become more apparent a couple of months later, as the summer heat gave way to the beauty of a Japanese autumn and Mt Fuji dominated the skyline even from within the stadium. From the main terrace, the view from the pitch, from harbour to hulking volcano, is breathtaking. The J League runs from March to December and is broken into two halves to allow a mid-season break during the hottest part of the year. By the time I made my debut, as I like to describe it, on the terraces of the Nihondaira, Shimizu S-Pulse were riding high in the table, but always sufficiently adrift of the top few teams as to know they weren’t going to win the thing. Nevertheless, when I made my way to the stadium on a pleasant October afternoon I was filled will the familiar mix of emotions – excitement, nervousness, optimism. I may have been an outsider, and a new one at that, but Shimizu S-Pulse were already destined to be my team. I was fated to have to suffer through their lean spells and rejoice at their successes. This being Japan, I was able to cycle to the stadium and leave my bike chained to a rail in what was a fairly well-used bike shelter adjacent to the stadium. Earlier in the week I’d bought tickets from the club shop in the centre of town, where I’d naturally failed to resist the temptation to invest in an orange club shirt. It was truly an investment too; it was a means to demonstrate that I belonged, it was a show of pride in my new home town, and it would accompany me on many an occasion. And it was a lovely colour too. On entering the stadium, there was a degree of familiarity, but like everything else in Japan, it all had a uniquely Japanese twist. As I made my way into the ground, my senses were bombarded with the usual stadium noise of fans hailing their sporting heroes with chants and songs, but also with the smell of yakisoba noodles, pickled ginger and soy sauce as it was doused on various rice and seaweed snacks. Japanese stadium food was, and is, many levels above that which you’ll find in England. With noodles and a cold Asahi beer purchased, I stepped out onto the terrace and found a suitable place to watch the action. Far from being limited to the field of play, the orange worn by the Shimizu players was more than matched by the orange worn in the stands. Almost without exception, the watching thousands on the terrace were decked out in orange in one form or another. Many were adorned in multiple orange items in a fanatical show of support. Given the damp, rainy conditions, there were numerous official S-Pulse orange raincoats covering the shirts, jumpers, tracksuits and hoodies below. There were banners, there were giant flags, there were hats, there were bags, there were novelty clapping devices and hooters. What there was not was any sense of the hostility, the underlying anger, the edgy volatility of a crowd back home. This was fandom done in an inclusive, family-friendly way. But in homage to the Italian ultras, there were several young men stood on big steps with their backs to the pitch to lead the crowd in their chants and choreographies. This was support organised to the extreme. Spontaneity was limited to goal celebrations, near misses and refereeing complaints only. As the game went on, the chant leaders began each song on a loud hailer, and their support cast directed the masses in the appropriate words and movements to go with it. And this is where the Japanese support took things to a whole new level. Every chant had its own set of choreographed moves to go with it As the new guy, I stood out for my lack of knowledge not only of the words I ought to be singing (and it was singing, rather than the more shouted version of the English fan chant), but also of the relevant moves and dances I should be doing. My neighbours on the terrace took pity on me and guided me through it. Being far from a natural mover, my efforts caused much hilarity. Just as each chant had begun in a coordinated way, so they ended in the same style with the chant leaders crossing their arms above their heads to signify we should all stop right away, which we all did immediately. We were a compliant mass of fandom, doing the bidding of those appointed to direct us, without question and without deviation. Just how did everyone know the moves so well? It seemed far too coordinated to have merely evolved on the terraces, spreading through the crowd over time in the way that chants emerge in much of the football world. The truth would become clear to me a few months later during the interval between J League seasons. Throughout this time, the ultra groups – those that supplied the chant leaders, without any of the aggressive undertones that, say, a stereotypical ultra group may have – release YouTube videos of the coming season’s new chants, with a group of three or four singing away while banging on a giant drum. If there are any moves to learn, they demonstrate these too. It’s a very organised, very uniform, and in short, a very Japanese way of taking an element of football fandom and making it their own. Crucially, from a Japanese perspective, it also ensured that everyone would be doing the same thing in the same way. In so many aspects of Japanese culture and Japanese life there is a standard, set way of doing something. To veer away from this, as many a foreigner in Japan tends to do in an effort to speed up a process or cut a few corners, is not the done thing, and generally leads to a slower resolution as all semblance of balance and order has been cast asunder. As it is in Japanese life, so it is also in Japanese football support. There was still the reactive nature of gasps, cheers and occasional fury from the terraces, and these were as natural as they would be in a football ground in England, though undoubtedly less vitriolic, angry or aggressive. But the humdrum of support during the game was very efficiently organised. Not being privy to any of these YouTube clips prior to my debut appearance on the terraces of the Nihondaira Stadium, I stuck out like a sore thumb, but did my best to join in the fun. On the pitch, our heroes were doing us proud, running out 2-0 winners over FC Tokyo, those big city upstarts coming to our provincial home and being sent packing. The skies had cleared by the end of the entertaining game, giving a grand view of Mt Fuji as we hailed our triumphant team. The S-Pulse victory kept their push towards the higher reaches of the J League going for another week. As we hailed the victorious players, fireworks littered the sky overhead in celebration of another victory, as they would after every win. My new hometown team would become part of my Japanese rituals over the course of my time there. It would become a topic of frequent classroom discussion with the Japanese students in my language teaching job. It would inevitably lead to disappointment of course, as is the way with teams I support. But on this first jubilant day, as I cycled back towards home, stopping off at a cosy izakaya bar for a few celebratory drinks, I knew that I was now a part of Shimizu S-Pulse and they were a part of me.